DDR5, the natural successor to today's DDR4 memory that brings with double the bandwidth and density versus current generation DDR4. along with delivering improved channel efficiency, is expected to be available in the market starting 2019. JEDEC, the standards body responsible for the DDR specifications, says that base DDR5 frequencies should be at around DDR5-4800 - more than double that of base DDR4's 2133, but a stone throw away from today's fastest (and uber, kidney-like-expensive) 4600 MHz memory kits from the likes of G.Skill and Corsair. DDR5 is expected to support data rates up to 6.4 Gb/s delivering 51.2 GB/s max, up from 3.2 Gb/s and 25.6 GB/s for today's DDR4. The new version will push the 64-bit link down to 1.1V and burst lengths to 16 bits from 1.2V and 8 bits. In addition, DDR5 lets voltage regulators ride on the memory card rather than the motherboard. CPU vendors are also expected to expand the number of DDR channels on their processors from 12 to 16, which could drive main memory sizes to 128 GB from 64 GB today. Whether this will be good for end-users in relation to DDR5 memory prices remains open for debate; however, considering the rampant memory prices this side of 2017, chances are it won't be unless supply increases considerably. So 2021 earliest for DDR5 chips to hit the market in volume, actual sticks maybe a year later pending how fast it's adopted. We are yet to see DDR4 3200Mhz(JEDEC spec and not fraudulent SPD enhancement) and there are talks of DDR5, guess DDR4 will be DDR RAM standard with slowest adoption so far. So 2021 earliest for DDR chips to hit the market in volume, actual sticks maybe a year later pending how fast it's adopted. It's OK even at 2022. Both Intel and AMD already have a roadmap laid out for the next 4-5 years and it does not involve anything radically new, including DDR5. I for one care less for this, and more for a revised SO-DIMM standard. The prevalence of thin-and-light laptops has made clear the restrictions of the relatively large size of this standard, so to avoid the idiotic "solder everything to the board" tendency, we need smaller standards. m.2 did this for PCIe, now it should be RAM's turn to go on a diet. My suggestions: either DIMMs half the size of current SO-DIMMs, or dual-channel DIMMs so that a single DIMM won't strangle your CPU and iGPU. 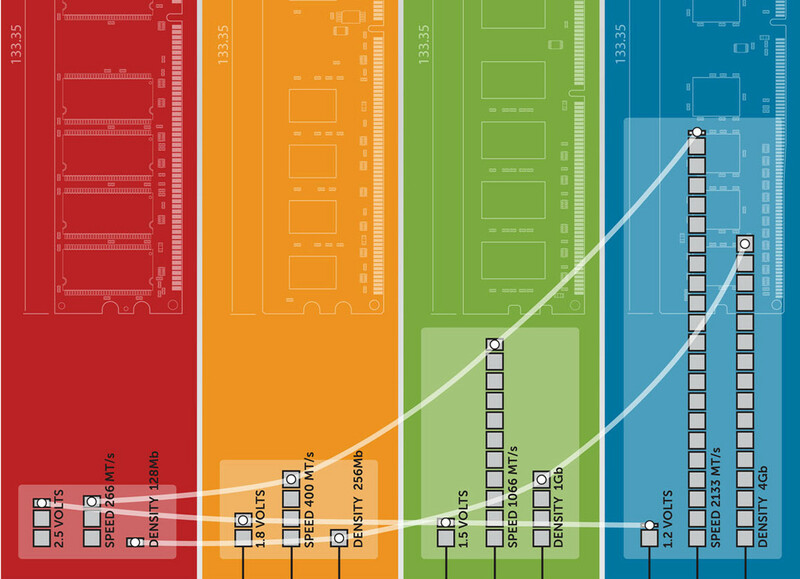 Of course density would be an issue here, but what's stopping us from stacking RAM chips? Or just relying on process shrinks to shrink package sizes, with a new mounting standard to match? Of course higher density means more complex PCBs, but that ought to be par for the course at this point, and not something to really affect pricing. THIS COMPANY IS STILL AROUND??? They don't need to worry about AMD/Intel taking their sweet time. While they do their thing, Rambus can go around cornering markets like embedded systems, smartphones and tablets. I can especially see them inking a deal with Apple since the latter seems that it would love nothing more than divorcing itself from Samsung. The markets have a development cycle short enough to use the tech in a timely fashion once it arrives. "Get off the Bus Gus"
I really wish DDR5 went the QDR route instead. 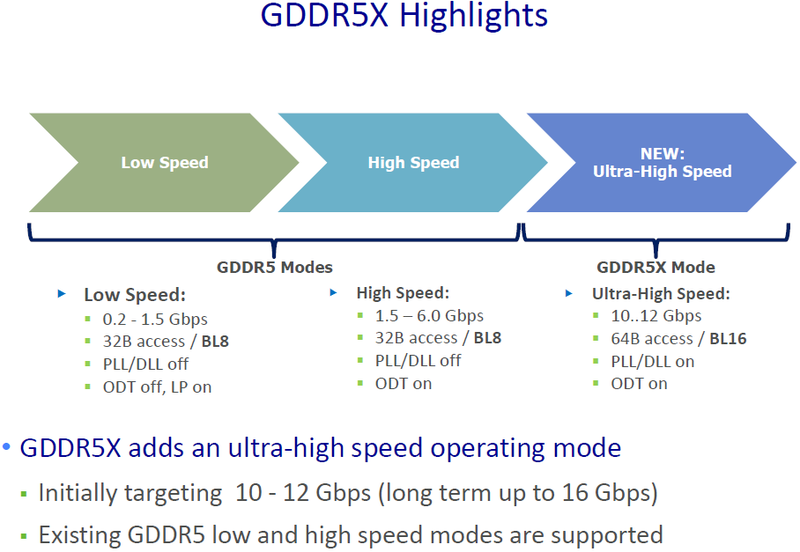 QDR is already in use now, more so commonly in SRAM and also GDDR5X is actually QDR as well. This would have a much more significant performance boost than just MHz bump up. This could be incorporated with the other features upcoming to DDR5. QDR could also downclock, like GDDR5X, so you could have best of both. The main purpose of this capability is to enable reads and writes to occur at high clock frequencies without the loss of bandwidth due to bus-turnaround cycles incurred in DDR SRAM. QDR SRAM uses two clocks, one for read data and one for write data and has separate read and write data buses (also known as Separate I/O), whereas DDR SRAM uses a single clock and has a single common data bus used for both reads and writes (also known as Common I/O). This helps to eliminate problems caused by the propagation delay of the clock wiring, and allows the illusion of concurrent reads and writes (as seen on the bus, although internally the memory still has a conventional single port - operations are pipelined but sequential). When all data I/O signals are accounted, QDR SRAM is not 2x faster than DDR SRAM but is 100% efficient when reads and writes are interleaved. In contrast, DDR SRAM is most efficient when only one request type is continually repeated, e.g. only read cycles. When write cycles are interleaved with read cycles, one or more cycles are lost for bus turnaround to avoid data contention, hence bus efficiency is reduced. Out of all the hardware improvements for all devices & range of products (choices) available for each such as GPUs, motherboards, SSDs (from protocol, to socket type), etc, RAM still seems the most archaic in various ways. Hell, even ECC is still locked up, artificially market segmented. Those for example who want ECC AND performance for Threadripper are out of luck. You have to choose in a black or white manner since kits out now are utterly low end MHz wise; not even ONE black PCB in existence either. Oh hell I'm gonna play me some Paul Simon tonight, TY sir. The Platinum Pied Pipers version of this was dope too. The higher density/lower power is also a factor. From a bandwidth perspective, APU's could benefit for graphics performance. All in all, it seems mostly the laptop/mobile segment has the most to gain until something like HBM becomes readily available. IIRC correctly, RAMBUS literally fubarred several different memory concepts many years ago to the point where anyone who was anyone in the computer field back then repeatedly sued the crap out of them, some for patent infringements, some for IP theft, and still others for what was essentially vaporware, because nothing they made or attempted to make either didn't work at all , or didn't work anywhere as well as they claimed it would. Thats not the story I've been fed before, Rambus was great if it could be implemented, but its the other things that kept it from becoming a thing, high cost, harder to make, and then there was some "fine print" that could not be agreed upon with Intel who was the biggest potential client at that time. It just wasnt popular enough for the home pc users or board makers, most just just didnt want the hassle of being a guinea pig for it, there was one more issue, something with BIOS, I forget, it was eons ago. Agreed, hoping to see sodimms at the size of sd card or bit bigger. Impossible? nah decades ago we had 1mb storage at the size of cabinet, now we can have 128gb at the size of our fingernail. Who knows? Will this mean that memory timings will finally come down? I've noticed that lately as memory bandwidth has gone up memory timings have shot through the roof unless of course you buy very expensive very high-end enthusiast RAM. density.. that is a good one i didnt think of. apus performance increases flaten out with increased bandwidth. Lower voltage nobody really cares about, you think? They use a few watts...they dont run hot... etc. No. Why would the trend of higher speeds and looser timings change on the same technology? So what? Memory timing increase proportionally with the speed. CAS latency and true latency are 2 completelly different things. As you can see, the Speed and Clock Cycle time are the ones that matter, not CAS timings. The bigger the frequency, the lesser Clock Cycle time is. My DDR3-2400CL9 is 7.5ns. I had some old DDR2 PIs that were 6.7ns (1200CL4). I think overall latency is getting worse. At least density and power draw is getting better though.